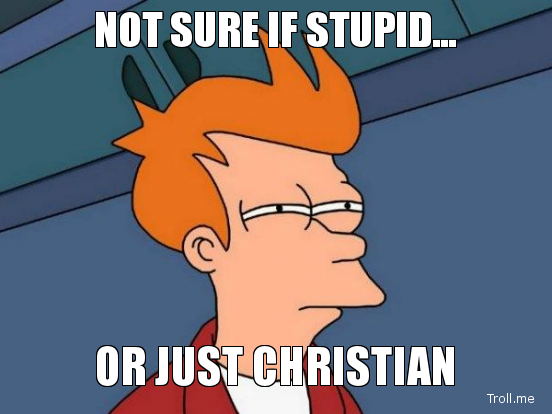 Debunking Christianity: Are Christians Stupid? I have to disagree. I know many Christians who are quite intelligent. 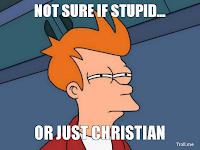 Do Christians hold stupid beliefs? Absolutely. Are there Christians who are stupid? Undoubtedly. Just try and follow Pat Robertson’s rambling incoherencies, or pick a different clown from the televangelist freak parade. Are there certain groups or denominations within Christianity which tend to denigrate reason, and celebrate emotionalism and mindless belief? Most assuredly. But, haven’t we also encountered atheists who are uniformed about certain things and yet hold dogmatic assumptions nonetheless? Human beings are nothing, if not diverse. With any trait, we fall at various points along a range. We defy tidy categorization. People can have high IQs and still be irrational in some of their thinking. Many people use reason up to a point, but then also have areas of their thinking which are "no-fly zones" for reason. They do not apply the thinking that guides them in other areas of their life to these beliefs. It may be cherished religious ideas, or a belief in the paranormal. Or, they may hold prejudices or biases. For a variety of reasons, they have never examined these beliefs and hold them unchallenged. This does not automatically make them stupid people. It simply means they are inconsistent in their thinking. rationalize, fall prey to confirmation bias and a host of other faulty thought processes. Inconsistent thinking is a problem we all face. If we live in an echo chamber where we do not hear dissenting opinions, then we are never forced to examine the ideas we hold. Many fundamentalist Christians live in a carefully-sanitized, climate-controlled ‘spiritual’ bubble. They may have gone years, or perhaps decades without ever talking with someone who calls their cherished beliefs into question. 2. Christians who were immersed in fundamentalist religion from a young age have been through a long process of mental conditioning. This starts well before the critical reasoning skills of the mind have developed, and like the frog in the kettle, the heat is slowly turned up without them noticing. Imagine being introduced to the Noah story as a cutesy storybook tale about lots of fun animals and a boat. And rainbows! The religious child is not taught to empathize with the masses of people and animals drowning outside the Ark. By the time they are an adult, capable of understanding the horrific genocidal implications of the Bible god’s deluge, they have already been desensitized, and if their thoughts ever dare to drift into questioning whether Yahweh’s actions were righteous and loving… well they now know about a horrible place called Hell where he will send them if they get out of line. 3. Fundamentalists have had important facts withheld from them. They are not typically going to be aware of the influence of how Genesis borrows from Mesopotamian creation and flood myths, or the JEPD textual theory of the Old Testament. They generally not have studied comparative religions, and aren’t aware of how the beliefs of Judaism and Christianity have changed and adapted over time. Popular apologetics writers like Lee Strobel and Josh McDowell are masters at controlling the information flow in their presentations and books. They carefully neglect to explore evidence which undermines their case, while overselling the ‘proofs’ for Christianity. The average Christian is going to trust them, not fact-check or dig deeper. 4. Fundamentalists have been given false information: about evolution, the reliability of the Bible, about what life is like without belief in a god. They have been assured by people whom they deeply trust that these things are so. Like the town elders in M. Night Shyamalan’s movie The Village sought to control the townspeople through fear and lies about the outside world, Christian leaders spread misinformation so that they can control their flock. 5. There are mechanisms in place which are implicitly designed to stop beleivers from questioning, and finding their way out of the religious maze. Apologists like Copan, Geisler, and Craig seek to soothe restless, questioning Christians – calming them down and keeping them in the fold by giving ‘reasoned’ answers to biblical and theological difficulties. Their job is not primarily to convert skeptics into believers. They are the spiritual cowboys, singing to keep the herd calm through the long dark night of the soul. Family and friendship ties are often mediated through the church and this attaches a high cost to defecting. For many, the price is too much to pay and so they suppress or abandon their questions. Fear of losing their salvation, the terror of Hell is often sufficient to stop reason in its tracks. Christians are warned that they can be deceived by Satan and the ‘philosophy of men’. A whirlwind of church busyness and involvement (by design) leaves very little time for examining one’s beliefs. No, most Christians are not stupid, and we certainly won’t liberate them from mental chains by telling them they are. They are people with a slave’s mentality. Those of us who come from a fundamentalist background have perhaps a greater amount of empathy for these folks, because we once inhabited their mental prison cell. Perhaps we can educate our fellow atheists about what that experience was like so that they can be better equipped to reach them. Christian leaders who mislead and misinform are fair game to be mocked and scorned, as are the ludicrous beliefs which Christians are indoctrinated with. We certainly don’t need to waste time with those who claim to be interested in truth but are unwilling to even consider reasoned objections to their faith. But, there are believers out there who do harbor doubts, questions, and reservations about their religion. We need to encourage these people to fully utilize the reason and intelligence they already possess – and to have the courage to follow the evidence wherever it may lead.